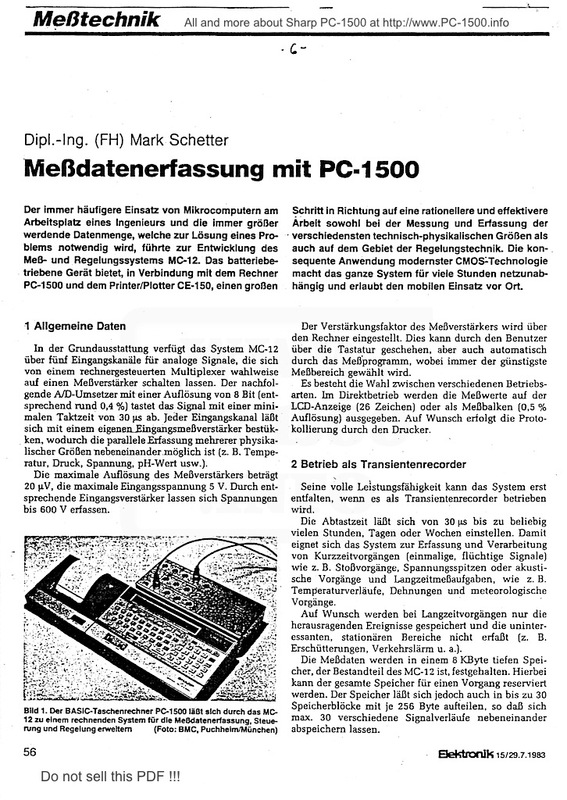 The More frequent use of microcomputers in the workplace of an engineer and the ever increasing amount of data that is necessary to solve a problem, led to the development of measurement and control system MC-12th The battery-operated device, when paired with the computer PC-1500 • and the Printer / Plotter CE-150, a major step towards a more rational and effective work in both the measurement and recording of various technical and physical sizes, as well as on the field of control engineering. The consistent application of modern CMOS: Technology makes the whole system for many hours mains-dependent and allows the use of mobile on site. The basic version of the System MC-12 has five input channels for analog signals, which can be switched by a computer-controlled multiplexer selectively on a measuring amplifier. The subsequent A / D converter with a resolution of 8 bits (corresponding to approximately 0.4%) samples the signal with a minimum cycle time of 30μs. Each input channel can sieve with a private Eingangsmeßverstärker bestükken, whereby the parallel detection of multiple physical sizes next to each other is possible (eg. 8. temperature. Pressure, tension, pH, etc.). The maximum resolution of the instrumentation amplifier is 20 microvolts, the maximum input voltage 5V. By appropriate input amplifier is voltage up to 600V can be recorded. The gain of the sense amplifier is set by the computer. This can be done by the user via the keyboard. but also automatically by the test program, with always the cheapest range is selected. There is a choice between different modes. In direct mode, the measured values ​​on the LCD display (26 characters) or as a measuring beam (0.5% resolution) will be issued. Upon request, the logging is performed by the printer. Its full potential can only develop the system when it is operated as a transient. The sampling time can be set from 30 microseconds up to any number of hours, days, or weeks. This sieve is the system for the collection and processing of short-term operations (single, fleeting signals) such. As shock processes, spikes or acoustic events and Langzeitmeßaufgaben such. As temperature gradients, strains and meteorological processes. Only the outstanding events are stored on request for long-term operations and uninteresting, stationary regions not covered (eg. As shocks. Traffic noise, etc.). The measured data are in an 8K deep memory, which is part of the MC · 12 detained. In this case, the total memory can be reserved for a task. However, the memory can also be found in up to 30 memory blocks divided by 256 bytes each, so that max. Allow 30 different waveforms next to each store. To select particularly interested in the parts of the signal, the ratio of pre / post-history in eight levels can be selected. The Aussteuerunganzeige the measured values ​​by means of LCD bar. The stored values ​​can be either applied directly to two analog outputs or arithmetical previously subjected to signal processing and analysis. A measuring process was taken and stored by MC-12, the signal can be tapped at one of the analog outputs. The output voltage is ± 5 V to 100 ohms. A single signal or an arbitrarily long lasting measuring controls so that the Y • Input a recorder. The output speed is selectable and is suitably adapted to the setting speed of the recorder. The time axis is directly from the recorder or the computer – second analog output of the MC-12 to X input of the recorder – controlled. Two different signals y1, y2 (eg pressure with temperature) was added, may either both signals as a function of time (y1 (t), y2 (t)) are plotted, or a signal is shown as a function of the other (y1 = y1 (y2)); Here are the outputs of the MC-12 are located on the xy-inputs of the external plotter. The integrated printer / plotter documents the results of measurements and plots with a resolution of 0.2 mm with the available four ink colors are especially useful for playing various signals in conjunction with ten line types. The scaling of the appropriate coordinate systems is done automatically by the computer. 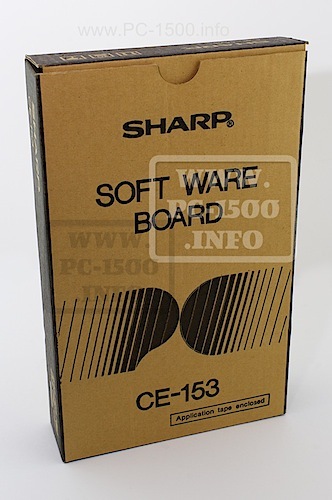 To give an idea of ​​the possibilities offered by the system described here, are below a grater typical applications together provided for which computing functions of the PC-1500 come to fruition. The collection can of course do not claim to be complete. Resonant circuit is detected by the MC-12 (Figure “J). and the differential equation when a component size is known. A periodic progress will be measured, stored and plotted by the MC-12. Subsequently, the frequency components of the process are calculated and printed and displayed as a bar graph (Figure 4). In a space to be examined E is generated in a stationary sound field using a loudspeaker. After switching off the sound source, the time course of the decrease in sound level is measured on a logarithmic scale, stored and plotted according to the physical definitions by determining a regression line, the reverberation time T is determined (Figure 5). 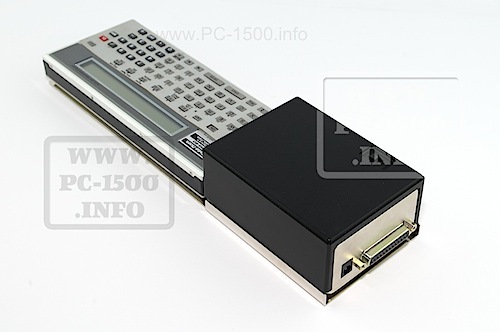 The essential advantage of the combination MC-12 / PC-1500 compared to other systems, the signal processing. From the simple logarithm to the Fourier analysis extends the range of possibilities. The user has the choice, in addition to the predefined processing variants using BASIC programs to transform the measurements according to his needs and evaluate. For complicated special solutions are custom software. Additional applications which are beyond the scope of traditional instruments, the system MC-12 offers in the field of control engineering. With four CMOS switching outputs (75 Ohms, 50 mA, +/- 10V), two relays and two analog voltage outputs (+/- 5 V) provides many possible keys. From a simple timer display over two-point control to complicated PID control system is the system load no application is closed. Simple programs for control and regulation are included in the system of the MC-12. With the help of detailed documentation, the user can create self-measurement and control applications. 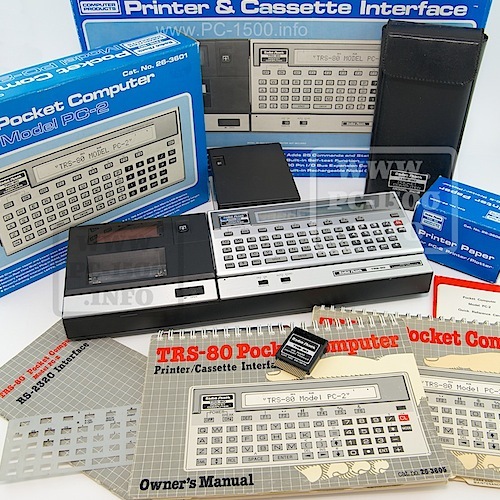 For this, 11 Kbytes program memory in the PC-1500 free for the user. The Measurement and Control System MC-12 was designed so that the user does not have to deal with the function of additional controls. 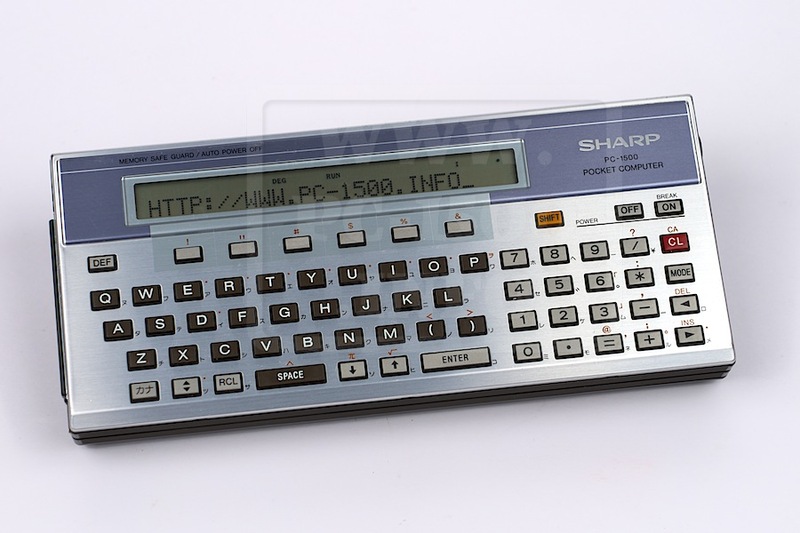 All functions of the MC-12 can be controlled via the alphanumeric keypad in dialogue with the computer. Operator errors are reduced to a minimum. Incorrect entries complained about the program itself. Once made settings can be saved and recalled when needed. This reliable reproducibility of test results is ensured. An additional check of the measurement parameters are documented on the printer. 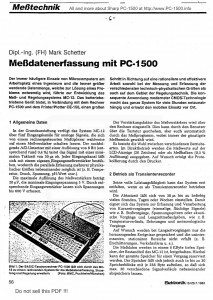 This entry was posted in 4-Extensions, Blog, Hardware and tagged BMC, Dr Schetter, MC-12, MC-12A on 02/25/2015 by Rom1500.